When I got my kiwifruit it looked like a rock. It looked like a potato. Next after looking at it, I felt it and it felt bumpy , like a rocky road. Its hairy like someones beared. After a few seconds it got a little soft like a soft ball. 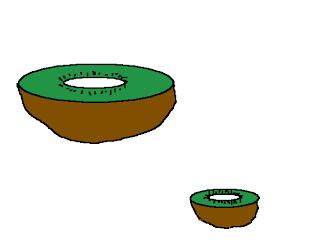 Mr Marks cut the kiwifruit in half. Inside it, it looked like ants were in the middle of the kiwifruit. The kiwifruit inside, it looked like a swimming pool inside it. The kiwifruit tasted crunchy in my mouth. Inside my mouth I could taste a seed. Also the seed was sweet like strawberry. Strawberry's have seeds on the outside but kiwifruit have seeds on the inside. When the kiwifruit was all gone it looked like a cup. It also looked like a bowl. I like your work grace that is the best from you girl keep it up and I can't wait for your next blog post.